Ray Manzarek, keyboardist and founding member of The Doors, died today after a lengthy battle with cancer. He was 74 years old. According to a statement on The Doors' Facebook page, Manzarek passed away at 12:31pm PST at the RoMed Clinic in Rosenheim, Germany, surrounded by his wife, Dorothy, and his brothers Rick and James Manczarek. Along with singer Jim Morrison, guitarist Robby Krieger and drummer John Densmore, Manzarek founded The Doors in Los Angeles in 1965. The band, which performed without a bassist (Manzarek provided basslines with his left hand on his keyboards), became a sensation on the Sunset Strip. Signing with Elektra records, they became one of the biggest bands of the late '60s, racking up hits such as Light My Fire, Break On Through, Hello, I Love You, Touch Me and LA Woman, among others. Following Morrison's death in 1971, Manzarek continued to tour and record and became the producer for another adventurous Los Angeles band, the punk rock group X. 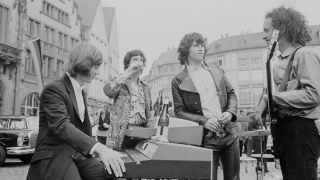 In 2002, he and Krieger went back on the road with a series of bands that played the music of The Doors. "I was deeply saddened to hear about the passing of my friend and bandmate Ray Manzarek today," said Krieger in a statement. "I'm just glad to have been able to have played Doors songs with him for the last decade. Ray was a huge part of my life and I will always miss him." In his own statement, Densmore said, "There was no keyboard player on the planet more appropriate to support Jim Morrison's words. Ray, I felt totally in sync with you musically. It was like we were of one mind, holding down the foundation for Robby and Jim to float on top of. I will miss my musical brother." The Manzarek family has asked that, in lieu of flowers, memoriam donations can be made in Ray Manzarek's name at www.standup2cancer.org.